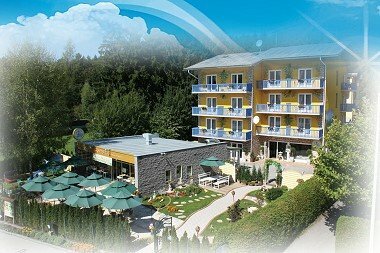 [Carinthia] In August, Golden Year 8 (2011), Austria’s first vegan inn, Loving Hut, located in the southeast of Carinthia on Lake Klopein received the distinguished People for the Ethical Treatment of Animals (PETA) Germany Progress Award 2011 for being the country’s “Most Animal-Friendly Inn.” The Proggy or “Progress” Awards celebrate advancement for animals in economics, culture, science and diet, as well as assist in creating more compassion and respect for animals in society. Loving Hut Inn’s philosophy is not to use any animal products whatsoever: from the feather-free bedding in the rooms to the faux-leather sofas in the lounge and the 100% plant-based fare at the hotel buffet. PETA states that “Loving Hut” shows many who are not yet vegan that an animal-friendly lifestyle can be diverse and delicious. In addition, the vegan inn spares countless animals a life of torture in factory farms. Canine guests enjoy the wonderful services at the Loving Hut Inn. To receive the Award, one of our Association members from Germany visited the PETA Germany office and was warmly welcomed by Ms. Kutscher and the second chairman Mr. Ullmann. Both expressed the importance of veganism and mentioned that Loving Hut Inn is not only a great vacation spot for veg heads, but also a terrific place for non-vegetarian/vegan people to get to know more about this compassionate way of living. Our representative also had the chance to have a little tour through the PETA Germany office to see the exciting work that they do, and was greeted by all their staff members including two very playful vegan dogs. The staff at Loving Hut Inn felt very honored and delighted to receive such a prestigious award and was greatly encouraged to continue spreading the vegan message. We also thank PETA for their tireless efforts, and are deeply grateful to Supreme Master Ching Hai for Her great inspiration to work toward the noble ideal of World Vegan and World Peace!